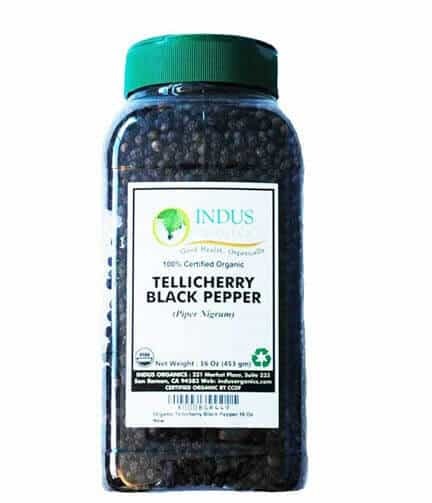 Indus Organics Tellicherry Black Peppercorns is not your typical black peppercorns. Unlike most commercially produced peppercorns there is no radiation, ETO, chemical fertilizers or pesticides involved in the cultivation of this organic spice grown in the Tellicherry region of Southern India. Product labels will rarely state when these are present and they are common so having a spice that is specifically free of them is a real benefit to consumers. Similarly, peppercorns are often packed in facilities that contain other allergens. Those with food allergies can use these without worry as well because they are packed in a nut free, gluten free and allergen free environment. The jars that they are packed in are also BPA free for an even healthier product and packaging. The taste is said to be somewhat more fruity and less of a bite or spice than other lesser quality berries. The quality of peppercorns is determined by the amount of “light” berries in the bunch, meaning the percentage of berries that rise to the top when placed in water. Tellicherry peppercorns have the lowest percentage of these floating berries. NO: Pesticides, chemical fertilizer, ETO, radiation. Packed in a nut, wheat and allergen free facility. Another stated: “…the flavor is so much better than regular pepper! There is definitely a difference in taste and these are worth the higher price if you love the flavor. All I can say is, if you are accepting what you’ve been finding in the store, you must try these peppercorns!” The fact that these come as whole berries vs the pre-ground style most of us are used to is a big improvement on taste. These are also great for those who are concerned about the pesticides and cross-contamination issues so common with other brands and varieties of peppercorn. Often pre-ground pepper will even include a wheat-based filler to bulk up the supply for a cheaper, less flavorful product as well. There can also easily be wheat cross-contamination, making it even more important for those who have severe allergies to have an alternative such as these whole berry Tellichery peppercorns.